I’m proud to be a member of Team PokerStars Online. Along with myself, the fastest poker player in the world Randy ‘nanonoko’ Lew, WCOOP Event Winner Anders ‘Donald’ Berg, twitter wizard and MTT specialist Shane ‘shaniac’ Schleger, we make up some of the biggest names in online poker. Now, you will have a chance to test your skills against me and the rest of the team, for FREE! Team PokerStars Online is going to give you a chance to win some cash by playing in our new Team Online Freerolls. Each month, $1000 will be up for grabs. You will also get the chance to play against me and other Team Online members, all with bounties on their heads. Eliminate a Team Online member and win a $25 bounty. It’s that simple. If that isn’t enough, PokerStars is giving you even more chances to play and win. 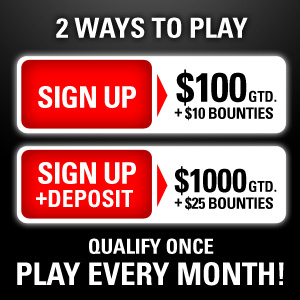 There will be TWO Freerolls every month! To enter the $1000 Team Online Freeroll, all you have to do is create a PokerStars account and make a real-money deposit on the PokerStars client using the Marketing Code ‘acoimbra’. For players who can’t deposit but still want to play on PokerStars, there’s still a tournament for you to play. This tournament will also be played by Team Online members and if you our fortunate enough to bust one of us, you will win $10 to help build your bankroll. Open a new PokerStars.com account. During account signup, enter the bonus Marketing Code "acoimbra"
Date & Time: 12:00 ET - The first Sunday of every month. Buy-in: FREE - just signup using the Marketing Code ‘acoimbra’ and you are eligible to play in the freerolls every month. Prizes: $100 prize pool in each freeroll. 20% payout structure.Team Online member bounty - $10 for each Team Online member you bust. Date & Time: 13:00 ET - The first Sunday of every month. Buy-in: FREE - just create an account with PokerStars and make a deposit using the Marketing Code ‘acoimbra’ and you are eligible to play in the freerolls every month. Prizes: $1000 prize pool in each freeroll. 20% payout structure.Team Online member bounty - $25 for each Team Online member you bust. To register for a Team Online Freeroll tournament, open the PokerStars lobby, click ‘Tourney’ & ‘All’. *PokerStars reserves the right, to cancel, modify or suspend this Promotion at any time. stefika11 amd meclart: Please mail support@pokerstars.com explaining that you created your poker account using the "acoimbra" code, but you didnt get your ticket, they will help you. see you at the freeroll! hueanu: Please mail support@pokerstars.com explaining that you created your poker account using the "acoimbra" code, but you didnt get your ticket, they will help you. my id albrizzi how can i get a ticket without a payment? tks!